Sure, you can find guitar tab just about anywhere online, but there are only a couple of web sites that offer fully licensed and professionally transcribed and edited tabs, and we are one of them. We're proud to bring you the most accurate guitar tab on the web, powered by Hal Leonard—long the industry standard. Looking back at 2016, we can see that you viewed a lot of tabs! Here are the 10 most viewed guitar tabs of the year. Not surprisingly, it pretty much matches our all-time Top 10. And that's great, as these are songs that every guitarist should try to learn. New Eagles Song Lessons for "The Long Run" and "After the Thrill Is Gone"
We're excited to bring you brand-new G-Plus Song lessons for the Eagles classics "The Long Run" and "After the Thrill Is Gone." The former is the title track to the band's 1979 release and features some nifty slide work, which instructor Doug Boduch thoroughly covers in his lesson but also shows you how to play it without the slide, if you're so inclined. The latter song appeared on the band's 1975 release One of These Nights. Co-writers Don Henley and Glenn Frey, well aware of bluesman B.B. King's song of similar title, famously asked, "We know that the thrill is gone — so now what?" As 2016 comes to a close, we're looking back to see what you, our users, enjoyed the most at GuitarInstructor.com. Our first category—and our most popular overall—is video song lessons. Not surprisingly, classic rock and the blues ruled the roost this year. Here's the list of our 10 most-viewed song lessons of 2016. Let us know what your favorites were, and what songs you'd like to see in the future! New Metallica Song Lessons and Official Tab for "Hardwired... to Self-Destruct"
With their latest release, Hardwired... to Self-Destruct, metal titans Metallica are back and heavy as ever. At the behest of the band themselves, we tasked virtuoso guitar instructor Chris Buono with teaching you how to play "Atlas, Rise!" and "Moth Into Flame"—two of the biggest and baddest tracks from the new album. Each of these lessons not only contains over an hour of step-by-step instructional video by Chris, showing you each and every killer riff, power chord, and solo but also a free download of the official note-for-note guitar tab! In addition, the fine guitar editors at Hal Leonard have completed the transcribing process for the entire Hardwired... to Self-Destruct album, and those guitar tabs are now available here at GuitarInstructor.com. Click the link below to browse all the titles. Guitarist Igor Presnyakov has become a YouTube sensation with his creative acoustic solo guitar arrangements of huge rock hits like "Nothing Else Matters," "Sweet Child O' Mine," "Beat It," and "Still Loving You," among others. 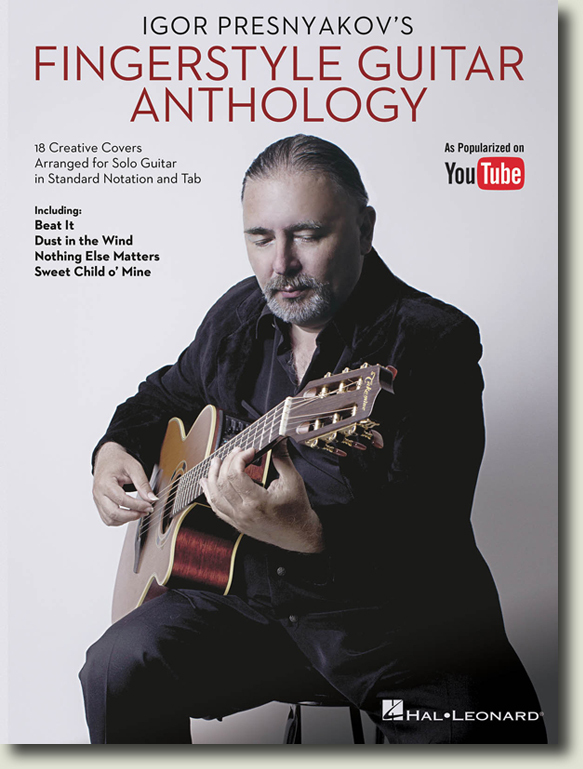 The fine guitar editors at Hal Leonard have transcribed 18 of Igor's arrangements, which we're excited to announce are now available at GuitarInstructor.com. Here's Igor performing Michael Jackson's "Beat It." The most successful act to come out of the '80s hair metal era, New Jersey rockers Bon Jovi have sold over 130 million albums worldwide—none bigger than their 1986 smash Slippery When Wet. The album features the band's three most popular hits, including the consecutive #1 singles "You Give Love a Bad Name" and "Livin' on a Prayer." We're excited to bring you brand-new G-Plus song lessons for those two monster tracks, each with an in-depth video lesson from Doug Boduch as well as scrolling guitar tab and audio backing track. In this week's Free Lesson Friday, instructor Peter Roller offers up a cool Muddy Waters slide lick in standard tuning (with a touch of Elmore James, too). If you dig this, check out Roller's complete lesson on Muddy Waters-style Chicago blues licks, titled Muddy Blues.